Let’s take a look at the interior of the case now.. The inside of the Enthoo Luxe has a very nice layout. There is ample amount of room to hold up to an EATX motherboard (or a GPU up to 347mm or 13.6″ long). There are plenty of cable routing grommets in this case. There is also a removable PSU cover (with a PCIe power routing grommet) included with the case. Note: There is also a layer of felt material to make sure that you do not scratch your glass panel. The back of the case features the usual Phanteks affair…… You get a nice Six (6) fan PWM splitter, a couple SSD mount locations. The case comes with Two (2) SSD mounting trays, that are installed in the front. The PSU cover has to be removed in order to install a PSU, and the cover is held in place by Three (3) thumb screws on the back of the case. The case also allows you to hold up to Six (6) HDDs or SSDs using the HDD trays. With the PSU cover’s thumb screws removed, you can easily mount a PSU in the case. The PSU cover uses anti vibration mounting points, just like the Drop N Lock SSD mounts. This way the PSU shroud does not create any extra vibrations. The PSU mounting area has rubber pads for short and long PSUs, to make sure that you do not transfer vibrations from the PSU to the case. The PSU cover design works great to conceal the cables, and still allows you to a couple of 140mm or 120mm fans in the bottom (the bottom HDD bracket needs to be removed for that). The HDD cages can hold Three (3) HDDs or SSDs each. 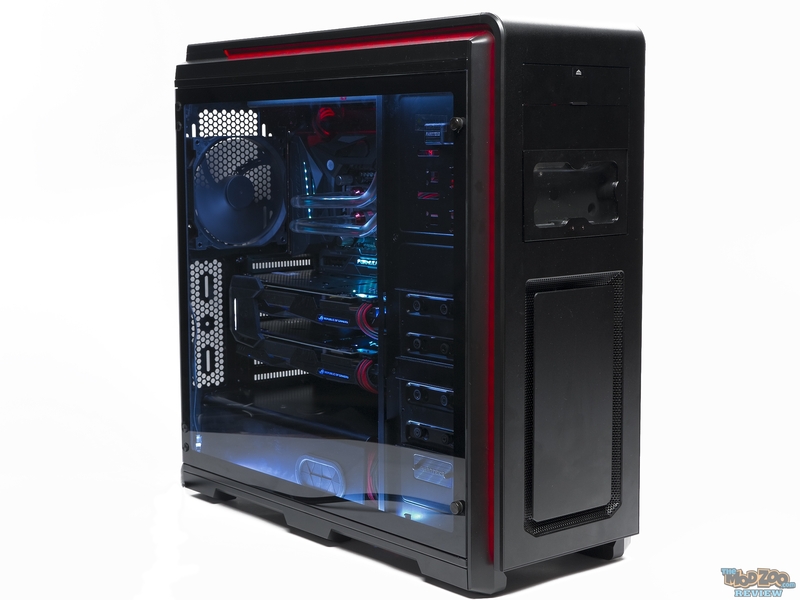 The case comes with Two (2) HDD cages that allow you to install up to Six (6) HDDs. That is a plenty of storage, even for someone who feels they need a quad SLI X99 file server! I have said this before, and will say it again: Phanteks has the best HDD mounting trays in the industry. They are the easiest to use, and hold the drives very securely (Note the silicone anti-vibration mounts). With both the drive cages removed, you can see that the case also has a spot for a couple 140mm or 120mm fans in the front bottom. if you are only going to use a couple HDDs, you can remove the bottom cage, and install some fans to add more airflow to your case. Here is a close up of the front panel cables that you must remove before you pull the front panel off. If you forget to do this, you could potentially cause some damage to the front panel RGB LED cables. Here is the other end of the front panel cables. The cables are just long enough to pass through to the back, and be connected to the RGB LED cable connector. The front panel has a filter that can be easily removed for easy cleaning. The front 5.25″ bay covers have a plastic frame, with screwed on decorative aluminum panels.